Some of the basics that I learned about porcelain lights: The style becme popular in the late 1920s. Like other porcelain bathroom and kitchen fixtures and tile, porcelain lights were desired because they were “sanitary” in an age very cautious of and careful about warding off disease. Their styling was charming… they were available in a range of colors and decorative designs … and the cost was relatively low. Porcelain lighting was dominant in bathrooms and kitchens throughout the Depression years and continuing to the end of World War II. 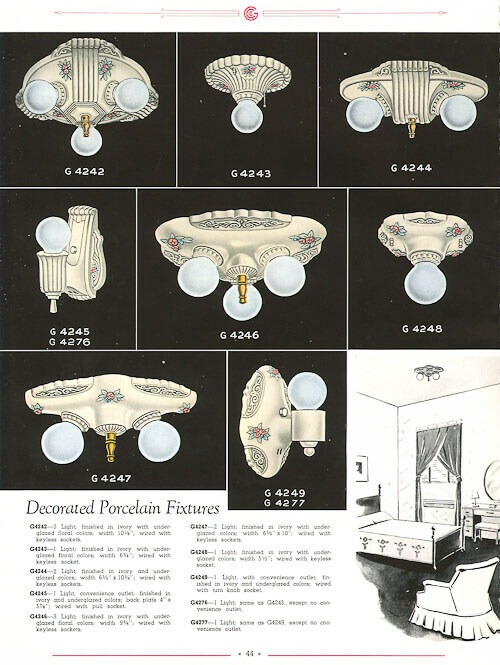 Porcelain sconces and ceiling fixtures — even some chandelier designs — continued to be sold widely through the 1950s, although more “atomic” chrome-plated fixtures overtook ‘old fashioned’ porcelain lighting in terms of widespread popularity once the Populuxe years (1953-onward) were in full throttle. Porcelain light fixtures were mostly used in bathrooms, but you could also find them in kitchens and even bedrooms. Some had shades covering the bulb, but there were designs with exposed bulbs, too. In addition to solid color fixtures, you could also get designs with small flowers and also pin striping in metallic paint. Bo was able, quick as a wink, to give me more information on the genesis of porcelain lights… he identifies some of the key brands…. and we even learn about parsing the term ‘vitreous.’ Bo also sent me all of the photos here — all from the Rejuvenation archives. Thank you, Rejuvenation! While the earliest common examples of the type appear in the mid-1920s, the category really hit its stride parallel with the explosion of colored sinks, tubs and toilets that were introduced beginning in 1929. 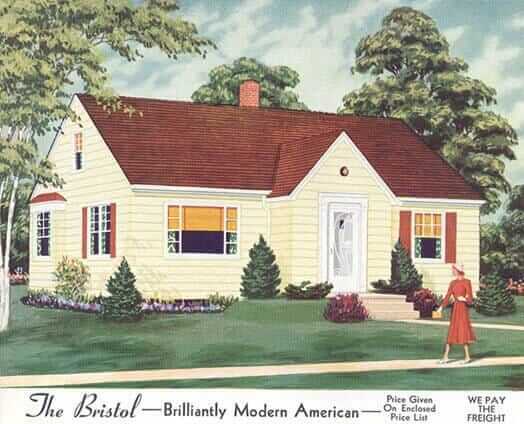 I’d call them a 1930s phenomenon rooted in Modernistic (Art Deco) and Streamline trends, that continued into the 1950s. Lots of colors were available to coordinate with bath fixtures, and even full metallic glazed options were made. 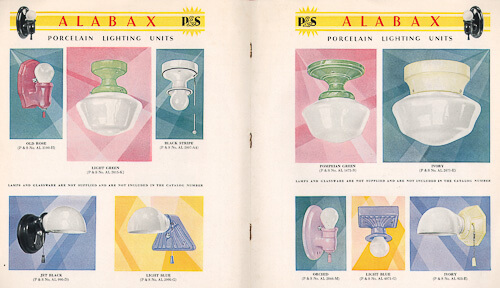 A few of the major manufacturers included Pass & Seymour (Alabax), Paulding (Kaolite), Durock (Efcolite) and Porcelier (known for having some of the more elaborate, decorative and dainty styling on the market). 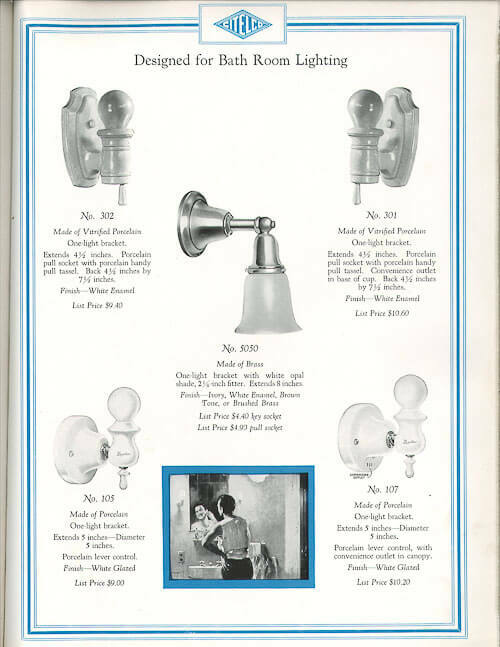 There were porcelain fixtures from many smaller manufacturers also, like Levolier, Franklin, and some lighting companies contracted to have their own lines made for them, including Markel, Lightolier, Frankelite, Sears and Montgomery Ward. There were dozens of “-oliers” on the market in every variation you can think of…. the -orama of its day. Porcelier was a company that specialized in porcelain fixtures. Levolier was a different company (and not Lightolier) that had one of the earlier porcelain fixtures on the market, attached. Most porcelain fixtures were distributed through jobbers/distributors rather than being sold directly by the company that manufactured them. Digging in, there is a lot of potential vocabulary confusion that warrants a quick aside. One important distinction to be aware of is the difference between “porcelain” (or vitreous china, like your toilet) and “porcelain enamel” (or vitreous enamel, like on an old stove). In both cases, “vitreous” means “like glass” – something that chemically changed when fired at high heat, becoming glass-like. If the base is clay or ceramic, it is porcelain (not true porcelain necessarily, which is a specific type of ceramic material, but “porcelain” in the same way that “silverware” isn’t always made of silver, but has come to mean flatware in general), and if the base is metal like iron or steel, it is porcelain enamel. 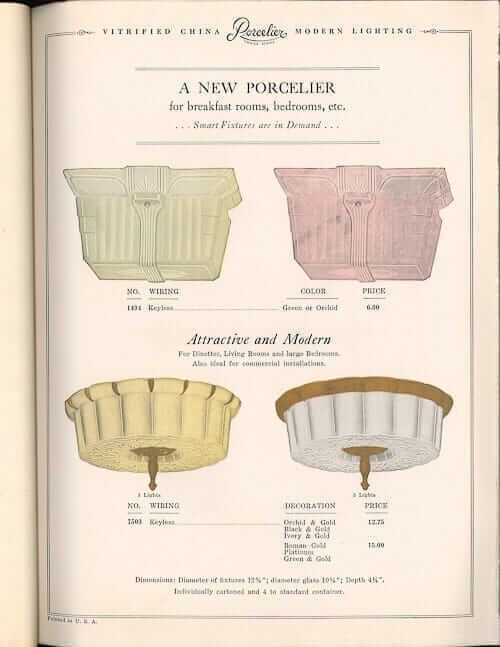 Fixtures manufactured by the Porcelier company were marketed as “Porceliers” (often side-by-side with Kaolites and Efcolites – can see why those names didn’t stick) so I imagine that would be the source, though in my experience I would not say that “porcelier” is a generic name for any porcelain fixture. Maybe in certain parts of the country it is more common though. I usually just hear them referred to as porcelain fixtures. 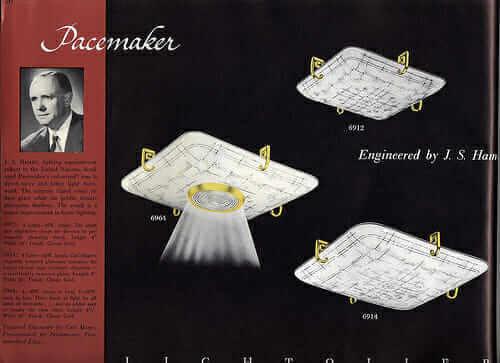 The plainer white porcelain “staple” or generic-type fixtures are no more rare than any other vintage lights I’d say, and the ivory-toned ones with exposed bulbs and little painted floral accents – “Grandma fixtures” we used to call them around here – are still an acquired taste for many. 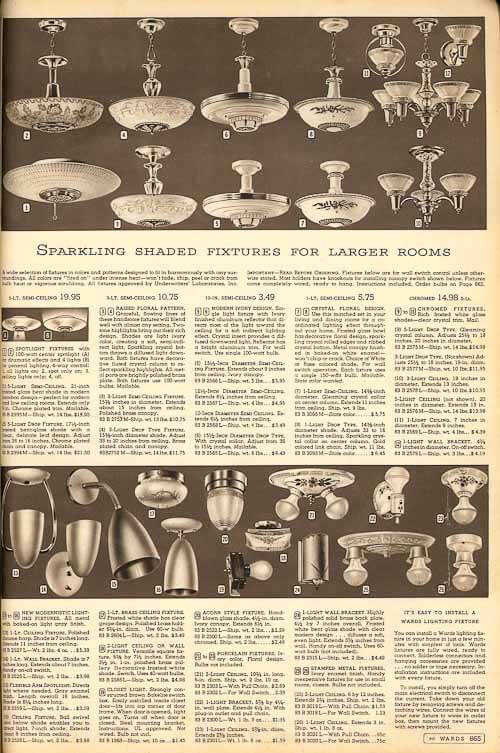 What I would call rare would be the high-style Deco-era fixtures in metallic or colored glazes, especially with the right coordinating shades, which could have been custard glass and/or striped with painted or metallic lines to match. Interest is strong, but not necessarily wide enough to be driving prices up beyond what dealers know to be fair for a cool and unusual fixture of the era. I.e., I think there is plenty of room for greater appreciation of these kinds of lights. One detail worth mentioning is that these lights often had a “convenience outlet” cast into them – convenient for shocking yourself to death. When we rewire, we always disable this outlet to be safe and meet modern codes. Yes, readers: If you buy a vintage light — consult with a properly licensed professional to ensure it is safe and/or needs to be rewired. You need to do this even if the light is New Old Stock. Thank you again, Bo Sullivan and Rejuvenation for this story. Believe it or not, the garage is a great places to find vintage porcelain sconces (and other fixtures) at estate sales. Many times, the house underwent a “do-it-yourself” bathroom renovation at some point. The Depression-era mentality of never throwing good things away still lingered, so the homeowner would carefully wrap up the old light fixtures and store them in the garage. The best part is that the fixtures are usually not priced, and those running the sale are usually willing to let them go for a song. Yes! You are right! 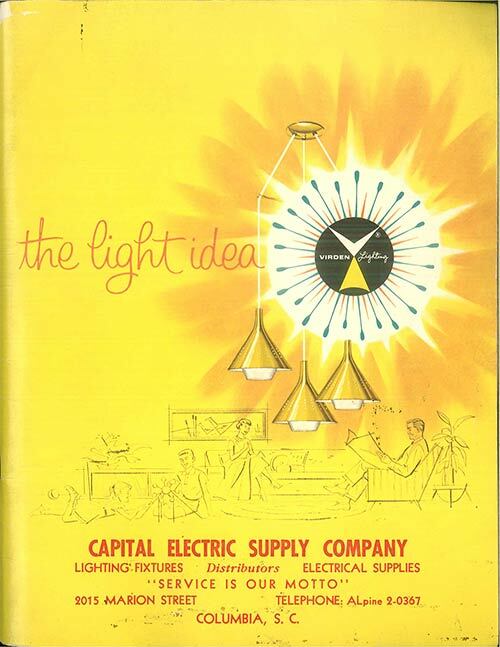 I have found lots of great deals on vintage lighting in basements and garages. Ummm, I have vintage lighting store — in my attic! I know this thread has been long asleep–but I was just packing up china to move from my 90’s tract ranch to my new 1966 DAYLIGHT RANCH (woohoo!) and noticed that the teapot my grandmother passed along to me was a Porcelier! I’m guessing it was manufactured after the company relocated to PA from OH in the 30’s. I’ll send a picture of the teapot–and of my ranch with WOOD PANELING AND BEAMS IN THE KITCHEN (also woohoo! )–if anyone is interested (and if someone explains to me how to do it). Congrats, couldbeveronica, connect with me via the Contact form on this blog (at side and on bottom) and I can give you info on where to send me pics. Hi Dave, I am not an expert on these — consult with a pro…. I love the Porcelier fixtures and found some gorgeous lavender ones for the bathroom in my 1920s house. Now I’m considering a new dining room chandelier. Were the Porcelier pendants ever used in dining rooms? Hi Jennifer, I don’t know the answer to this, historically speaking, but I don’t see why not. Lavendar! How lovely! I found a green sconce at the ReStore recently — need to figure out how to get the white paint off of it, but it’s gorgeous prewar green underneath! Just moved again into a new 1920s house. Brought with me the original vintage lavender bathroom lights and put beautiful floral Porcelier fixtures in all the bedrooms, along with a lovely porcelain and glass chandelier in the dining room. So much nicer than modern lights!